This sampler kit includes two imaging probes: AF647-RIS and AF647-RISPC. The two probes have different bone mineral binding affinities but the same spectroscopic properties. AF647-RIS has stronger bone affinity than AF647-RISPC, thus a shorter circulatory half-life. In contrast, AF647-RISPC has fair bone affinity and a longer circulatory half-life. 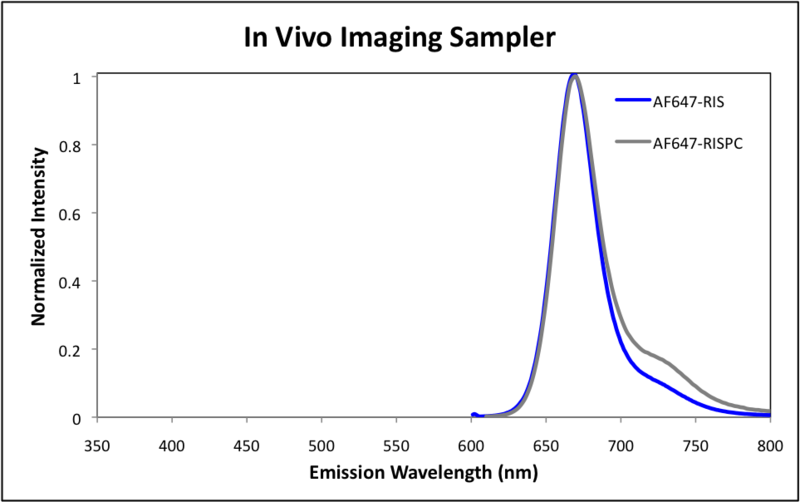 This sampler kit can be used for in vivo imaging studies. Emission spectra of AF647-RIS (in 0.1 M phosphate buffer, pH 7.0) and AF647-RISPC (in 0.1 M phosphate buffer, pH 7.0).